A little more than a month has passed since the globalists' candidate Emmanuel Macron entered into presidential office. And immediately began to put pressure on his real opponents with the help of administrative resources. Today it became known that the law enforcement agencies of France began an official investigation of the case of Marin Le Pen. Euronews writes that the investigation is conducted on the fact of "abuse of confidence" and on suspicion of "illegal use of the resources of the European Parliament." Investigative authorities claim that Le Pen's bodyguard Thierry Legier and the head of the Le Pen's Chancellery Catherine Grisse received money as her assistants in the European Parliament. They had already been interrogated, and Grisé alone was charged with misappropriating funds illegally obtained by exceeding official authority. Earlier, the European Parliament deprived Marin Le Pen of parliamentary immunity. But the existence of immunity did not prevent attacks on Le Pen before, in the midst of the presidential campaign of 2017. The outbursts were made exactly to ensure that the systemic media picked up a corruption issue that was extremely acute for the French. Remember that the candidate from the Republicans François Fillon passed positions exactly at the moment when they made a noise with Penelope-gate. There is also an attack on Le Pen's family including the famous father, the founder of the "National Front" Jean-Marie Le Pen. The 88-year-old man is accused of "incitement to discrimination, hatred or racially motivated violence." And Le Pen's. civil husband is accused of "misuse of funds" . 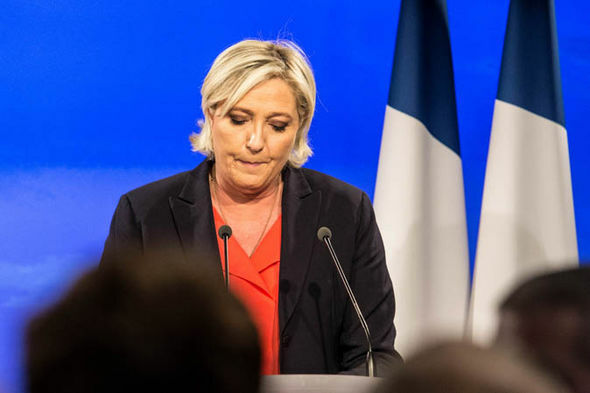 This time Marine Le Pen did not win the presidential election - but she gathered all the courage and announced the creation of opposition in the National Assembly. The fact that new persecution began on Le Pen only proves that she represents a real alternative to Macron. The young globalist himself is as loyal to the United States and Berlin as possible, and the inherited political system has been set up to serve the Elites' interests since the days of former presidents Nicolas Sarkozy and Francois Hollande. By the way, to create his own movement "En Marche!" Makron spent about 80% of the representative expenses of the French Ministry of Finance (about 120 thousand euros) but the French Media preferred to leave this fact in secret. French citizens may not even dream of a sovereign economy under Macron: the volume of public debt in France for the first quarter of 2017 increased to 98.9% of GDP and amounted to a historic record of 2.21 trillion euros. A polite policy towards new migrants will also have its effect in the coming years. That's when many will regret that Le Pen has to spend time and energy on the showdown with artificially inflated scandals, instead of leading the country out of a deplorable situation.